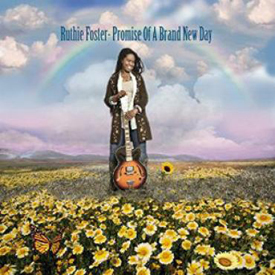 I don’t think I’ve ever been unable to review an album because I was enjoying it too much, but that has been the case with Promise of a Brand New Day by Ruthie Foster. Every time I’ve played it over the last few weeks, I’ve fallen in love with another piece of minutiae hidden in the lyrics or the way Ruthie sings, or the way the band sounds… meaning this review has been re-edited at least 10 times. This is Foster’s ninth album and, even though previous releases have been Grammy-nominated, I’d never heard of her. But, boy, I’m going to hunt down her back catalogue. The album opens with “Singing the Blues”, which sounds like as good a chunk of Southern soul as I’ve ever heard. It certainly brings to mind Aretha Franklin and Dusty Springfield in their cooler moments, as Ruthie’s molasses-sweet voice hangs in the air like a soaring eagle — beautiful, graceful, and a little bit dangerous. When I force-fed the album to my wife on a car journey, she immediately picked up on “Outlaw” as her stand-out track, but she couldn’t explain why. I’m damned if I can put into words why it is a truly great song. With a minimum of accompaniment, Ms. Foster goes into Miss Jody mode with a song about a woman who “bows down to no man / but is in love with three”. And, “she is an outlaw / she don’t wear a bra.” It won’t appeal to everyone, but “Outlaw” is one of the sexiest songs I’ve heard in years. I’ve always struggled with gospel songs but when Foster belts out “Second Coming” and “Brand New Day”, I could easily become a convert to whatever church she goes to. And, while the album seamlessly slides through many different singing styles, “The Ghetto” combines blues, soul, and gospel in four magic minutes that will stay with each listener for the rest of their lives. Ruthie Foster has been a diamond of a discovery for me. If you even vaguely like this type of music, I urge you to buyPromise of a Brand New Day. You won’t regret it.